Autumn, my favourite season, is over. 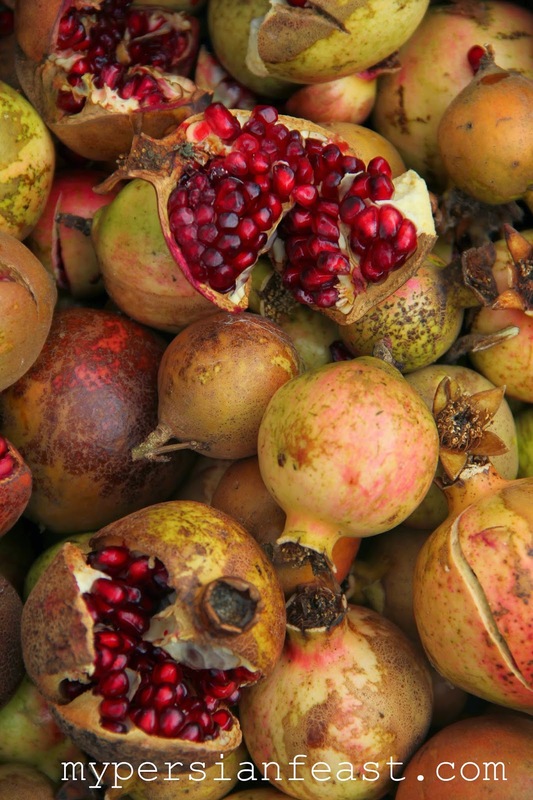 The end of pomegranate season marks the end of autumn. Luckily, the weather is still mild and pleasant and has that autumn feel to it. We dried a few trays of pomegranate seeds in the oven and set them aside for maman's chicken and pomegranate stew (sometimes with slices of fried eggplants). Most pomegranates are imported from USA around Christmas time, which is the Northern Hemisphere's autumn. This year, it has been great seeing NZ grown pomegranates in the markets. We have the sour smaller variety which is perfect for cooking (not to be eaten fresh). There hasn't been much activity in the back yard recently. Our backyard girls (chooks) got out of their coop a few times when I was looking after them and feasted on fenugreek, lettuce, spinach, coriander and parsley seedlings. So, quite a slow start to harvesting winter greens. We dug up Jerusalem artichokes and pickled them with chillies and herbs. This autumn, has definitely been a great chilli season! I came home the other day with a leg of lamb, probably the biggest leg of lamb I have ever bought ... 3.5kg! I struggled to carry it up the stairs with the rest of the groceries. Fearing what maman would say about the size of it, I pre-empted her reaction by saying I am going to make soup with the off cuts. She happily got into trimming, slicing, portioning and freezing, and I was looking up recipes of all things lamb online! It didn't take me that long to come up with the idea of lamb steaks and herbed couscous. Maybe for next time, but this time it was time for a hearty soup. Soup was always a dinner we had when someone was sick in our household and I still associate soups with illness! The chicken and noodle soup I always had was thick and hearty with chunky vegetables, a whole bunch of chopped parsley and a generous dash of lemon juice. The smell of parsley and chicken was way too strong for my liking. Once I tried to make the same soup for maman when she was sick. I made my brother drive all over Auckland to pick up a bowl of chicken soup from me and take it to maman. I had a call from her the next day to say "thank you but you shouldn't have". I got the message ... when she says you shouldn't have, it means it wasn't great! At that moment, I told myself chicken soup isn't my forte. I have never attempted to recreate that soup since that day, but instead I found a new favourite soup. Lamb and mint is a no brainer and with the addition of barley, it becomes a hearty and nourishing soup. Soups are the easiest foods to cook, but the ingredients must be carefully selected for an amazing soup. 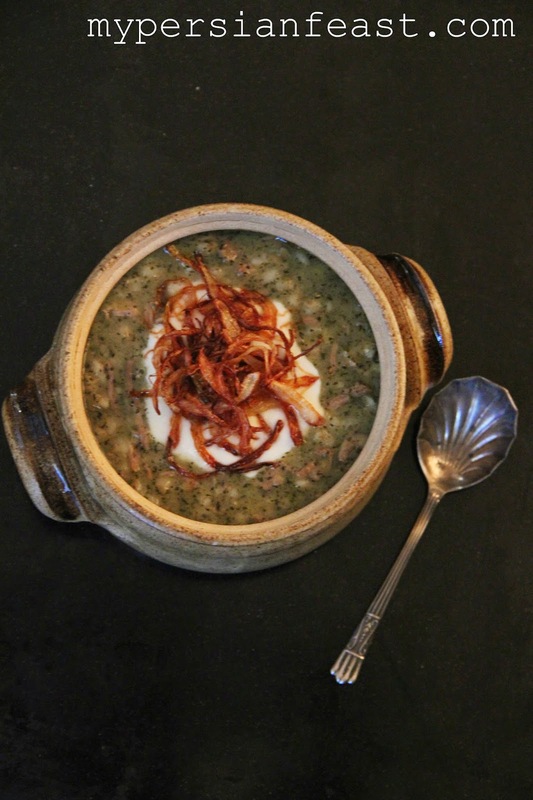 Fried onion flakes, mint and garlic along with kashk (yoghurt or sour cream substitute) are typical toppings for Persian aash (or soups). They are not decorations! They add extra creaminess, texture and flavour to soups and are absolutely essential so, best to make the extra effort. Soak the barley for a couple of hours before cooking. Saute chopped leeks with turmeric until soft. Add the meat pieces and brown them on high heat. Add enough water to cover the meat, reduce heat and cover. You can use stock if you have any. Once cooked, pull the meat off the bones and discard the bones. Add the barley and 2 more cups of water. Once the barley is cooked, add dried mint and allow to simmer for at least 10 minutes. Once cooked to your liking, season the soup. 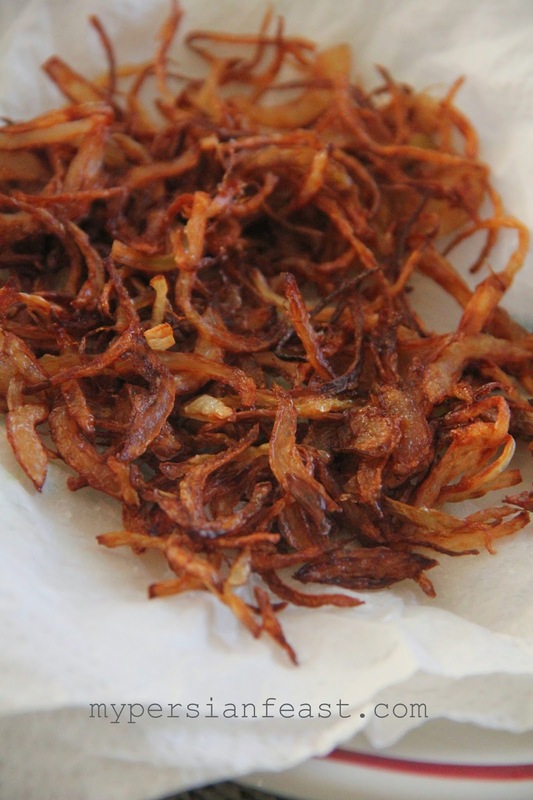 To make crunchy onion flakes, Slice the onions about 2mm thick. Add to a sauce pan of boiling water for about a minute and drain. Place on a tea towel to dry. Heat some oil in a small sauce pan, add the sliced onions in batches and fry until golden. Serve this hearty soup with a dollop of sour cream or yoghurt and topped with crunchy onion flakes.